On Wings of Eagles: Where is your focus? There are two kinds of birds that roam the desert: vultures and hummingbirds. The vulture thrives on a diet of rotting meat. He flies overhead searching for traces of leftover carcasses from slow-footed critters eaten by wild animals that have already had their fill. Hummingbirds, on the other hand, will sweep through the desert, passing over all those repulsive, dead animals and seek colorful patches of beautiful wild desert flowers. They will suckle the delicious juices of those sweet desert blossoms and be satisfied. 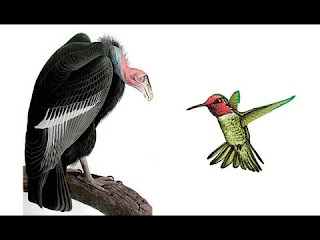 While vultures look to the dead for their survival, the hummingbird seeks the living! Likewise, some of us unconsciously look to our past with its regrets, failures, and sins to keep us alive. We think that somehow by looking back to those dead things, we might find some motivation to keep surviving here and now. But let's take a lesson from the hummingbird. Let's sweep past that which is dead and focus on the sweet new life -- the exciting future that God holds for us as we continue seeking Him and moving forward in our relationship with Him! Dear Lord, help us to sweep past the past and focus on the new things that You have for us. In the Name of Jesus, Amen. Your Developer knows exactly what He's doing. He brings forth an abundance! This fight ain't got any rear!